Obviously the element of surprise set in. The suspect, identified as 31-year old Giovanni Ramirez, had been arrested during a SWAT team raid, somewhere in my neighborhood. Thank God there was no gunfire or hostage standoff involved. All Sunday I was obsessed with finding out which street it all went down on. Was this really in East Hollywood proper, or a nearby area that for all intents and purposes was called “East Hollywood?” Certainly the L.A. Times has their geographical notion of East Hollywood, and so does the Council District 13 office, which also incorporates Koreatown north of 3rd Street. 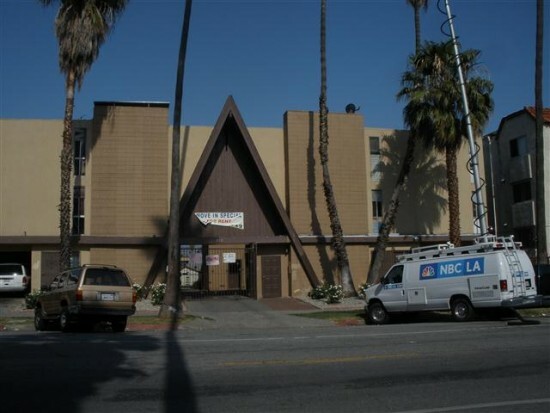 Eventually I got my answer later in the day, including a Channel 4 news segment, which showed the apartment building with the characteristic A-frame entry arch, on 822 N. Mariposa Avenue. Some friends of mine from Ramona Elementary School (my elementary alma mater, all but 3 blocks north of here) used to live on that street, and I still remember visiting their houses and apartments. Definitely East Hollywood, and all but seven blocks from where I live. Do I feel bothered? Offended? According to news reports, people who live in the apartment building have said that the suspect has only been seen there in “the past couple months” and was also reportedly living with a family. Certainly not from here, perhaps. The seven-week-long search for suspects in the March 31 Dodger Stadium beating was sort of like the local equivalent to the Navy SEALs raid earlier this month to kill terrorist mastermind Osama bin Laden, found in the Islamabad, Pakistan suburb of Abbottabad. The locals there had no idea the world’s most wanted man was living in their backyard. Now I can suddenly identify with the residents of Abbottabad. And like the Pakistani suburb,the media descended upon that place, where news reporters filming remotes were juxtaposed against everyday signs of life. 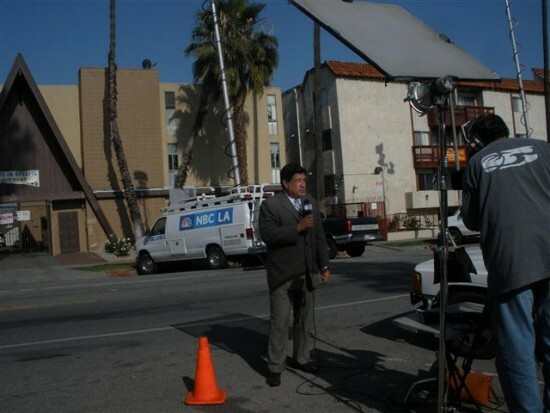 On Monday, I rode my bike there (which took all but three minutes) and right away found five news vans parked there, broadcasting transmitters extended almost as high as the palm trees. Residents walked their dogs, children wearing Ramona Elementary t-shirts bought ice cream from a cart, a produce tuck was selling its wares. But at the same time, the whirr of electric generators and the sight of news reporters rehearsing and filming their remote segments also set the scene on the street. And once in a while, the two activities would meet: As KCBS reporter Dave Lopez was preparing to to a remote, a resident’s car, parked diagonally on the ultra-wide, palmtree-lined street (the last vestiges of the street’s affluent past), was pulling out, another resident’s vehicle pulled in, and the remote paused for a minute as the cameraman navigated the incoming vehicle backing up into the diagonal spot. I snapped a few photos myself as a (local) lookie-loo, and even chatted with a photographer and reporter from the San Francisco Chronicle. The reporter even got a few quotes from me, mentioning the Abbottabad similarity. “Yep, guess he is L.A.’s bin Laden,” one of them said. Meanwhile, KCBS’ Lopez iterates his segment and mentioned that there is a photo of Ramirez, but the LAPD has chosen not to make it public at this time. “See? Another bin Laden similarity,” I told the photographer. The photographer also mentioned to me that Ramirez’s last known address was nearby — on Clinton Street, just east of Vermont. He told me he was there to take pictures, but there was no activity, though he mentioned the road was somewhat hilly there. Great, so this beating suspect really does live in my neighborhood. As conscious and sensitive I can be about my neighborhood’s portrayal in the media, the East Hollywood connection and reputation from this current news story doesn’t really bother me. The beating didn’t happen here, after all. Besides, our neighborhood got lots of love during CicLAvia, with “East Hollywood to Boyle Heights” being mentioned during every news report of the tremendously positive event. So I figure that was the yang to the beating suspect arrest’s yin. Worse things have happened to better neighborhoods, after all. As someone who was also at the Opening Day game at Dodger Stadium, I have to admit that there’s already enough connections to the incident than I would prefer to have. A couple other suspects of the beating are still at large. But I’m personally hoping they don’t live in the neighborhood too.